Currently, our drone is covered with wires connecting all the different components. 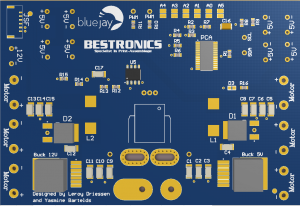 However, this will soon be over, since we are now designing our very own PCB, on which multiple components will be integrated together. This will not only save a lot of space, but also prevent wire ruptures. The picture below shows the design of the board. With the help of Bestronics, we will get it printed in the next weeks and we hope to integrate it on our drones before the final demonstration in June.